Literally one decade ago, shortly after the collapse of the World Trade Centre towers in Manhattan and amidst the backdrop of the mailing of anthrax-laced letters throughout the United States, my good friend Andy B (Biff Bam Pop’s resident Editor-In-Chief) and I decided to take a cheap flight to England and backpack that fair country, visiting the many historic haunts the country had to offer. Some of those locales, we discovered, were more haunting than others. At my request and by the lure of an advertisement in a London Walks guide, well studied at our hostel, the most chilling of experiences on that trip, besides the late fall British weather, was Whitechapel. And the Jack the Ripper Haunts walk. Yeah. You’re familiar with the nineteenth century’s most famous serial killer. Everyone is. Even today he remains a villain more vile, more despicable, more feared and more confounding than any other. So, on a drizzly, mid-October London evening, with the fog rising and a dampness setting deep into our bones, Andy B and I gathered our wits (and travelling fanny packs) and made our way to the Tower Hill Underground station to meet our walking guide: former Curator of the City of London Police Black Museum, historian, author and Ripperologist, Donald Rumbelow. It was a strange but happy coincidence, really. There are many guides that can take you through the Jack the Ripper Haunts walk but I had just finished reading Rumbelow’s The Complete Jack the Ripper, published by Penguin Books. It contained detailed accounts of life in the Whitechapel area of London circa 1888, the year of the Ripper’s activity, along with some truly gruesome images of the killer’s victims (it was a great read!). And being paired with the author – our guide! – on the walk made the experience all the more authentic. Rumbelow, it should be noted, was the authority that took Johnny Depp on a private tour for the actor’s research into the history of the famous crimes for the film version of From Hell. Now, that’s my kind of authentic! Through wet, paved and sometimes cobblestone streets and alleyways, with the temperature dropping and the moisture clinging to our jackets and jeans, we meandered our way from one murder site to the next, all the while storyteller Rumbelow providing the historic narrative in bloody detail. It was as if we had stepped back in time, Andy B and I, detectives piecing together the clues, the facts, the names and the motivations of the case – all in an attempt to answer the unanswerable. 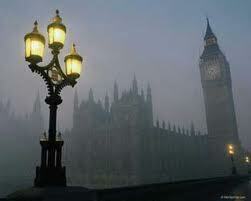 Old ghosts walked there beside us in the mist and shadows fell long and illusionary from the London streetlights. Footfalls echoed ominously and strangers seemed menacing. These were the places where throats were severed, where abdomens were ripped, where human organs were removed, where life was taken. It gets to you. Over one hundred and twenty years later and it still gets to you. The jovial noises emanating from the Ten Bells pub, a pub, we were told, that Jack the Ripper frequented in order to seek out future victims, welcomed us heartily at the end of our disturbing walk. Being amongst lights and laughter and living people made for a welcomed respite. 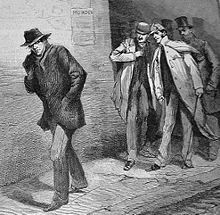 Over the years, there have been many theories and even more suspects but the Ripper murders, of course, have never been solved. Jack was never caught. And the gory slayings ended as abruptly as they had begun. And that’s what has kept our attention, our interest and, it must be said, our enthusiasm all these years: the not knowing; the uncertainty. Books, plays and films, both in fiction and non-fiction a, have all conveyed – and made more famous – the heinous crimes that afflicted late nineteenth century London. The fact that the enigma of Jack the Ripper is still so prevalent in today’s zeitgeist is proof that his real life villainy eclipses so many other easily familiar names. Perhaps that is the only proof we will ever get in the Ripper case, the only proof we will ever really need: a shadowy ghost from a bygone century that still sheds light on us and our fears, today. A decade ago, in the comforting light of the Ten Bells pub, Andy B and I ordered room temperature British ale in an attempt to warm our blood. When I think about Jack the Ripper, my blood instantly freezes.